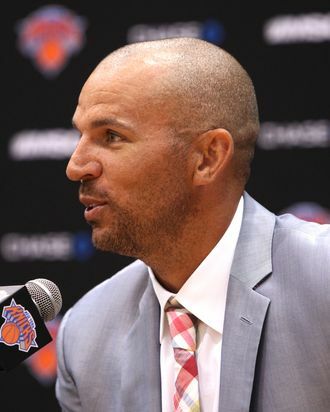 Barely a week after he announced he was retiring after a final season with the Knicks, Jason Kidd is working on his next move, and according to the New York Times, he would like it to be to Brooklyn to coach the Nets. Kidd faces more experienced competition in Grizzlies head coach Lionel Hollins and Pacers associate head coach Brian Shaw. But he also spent 2002 and 2003 making the Nets win, “and is close to Deron Williams, the Nets’ star point guard.” That’s got to count for something, right?